Club members have been helping to promote FMPGC within the community this week, with Trefusis in pride of place outside our local Asda supermarket in Penryn. 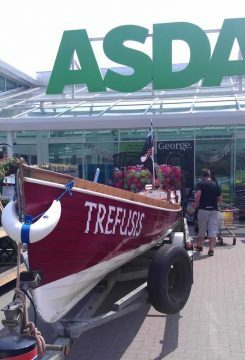 Trefusis will be taking part on June 3rd in the Jubilee Pageant on the Thames to mark the Queen’s Diamond Jubilee. Information about our special role in the event plus details about joining FMPGC have been shared with the passing shoppers. Pamela Parker, FMPGC head of fundraising and corporate events, made all the necessary arrangements and created the information displays. Teams of club members have taken it in turn to talk to anyone interested in our club or in taking up rowing. Lots of new enquiries have already been made. 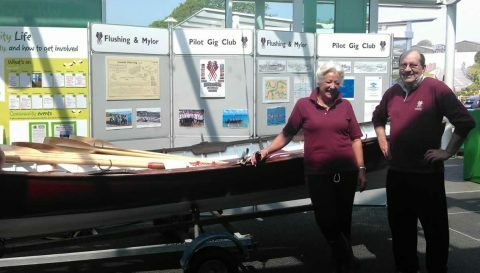 As well as our gig, we are also displaying our skiff – Joker – in the supermarket foyer area.